Animation site Xtranormal is having a Summer Movie Contest with a $1000 first prize and they also just released a new set of Star Trek themed characters and backgrounds called Trekkiez. I decided to combine the two into this blog post by featuring their new characters in my Summer Movie Contest entry below. If you enjoyed the above animation then I'd really appreciate it if you took a moment to visit the animations Youtube Page to click the Youtube 'Like' Button under the video. The top ten most liked videos will all win a prize. As mentioned, first prize is US$1000, with second prize being an iPad 2 and third an iPod Touch (any of which I'd be happy to win but first would be awesome). The competition ends at the end of July 2011. Long time fans of my online animations may find the theme and script of the above animation some what familiar. That's because I based it upon the ideas that feature in the script of my original GoAnimate, Star Trek Quogs series, Laundry Day. 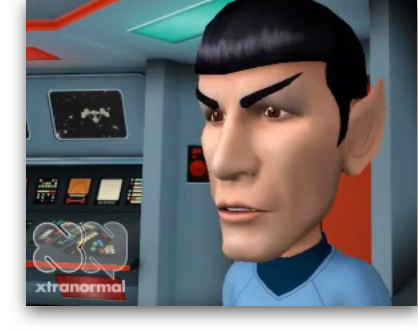 Xtranormal's Online animation creator is limited to two characters and one scene, hence the lack of the rest of the crew on the Enterprise's bridge. But hey, I figure it's Laundry day so everyone is out doing their laundry. Remember if you enjoyed this animation and would like to help me win a prize visit the video's Youtube page and click the Like button. I'd really appreciate it.